Understand the Maeda method and you’ll get very good at the middle game and won’t lose fights, Ryo Maeda 6P (r) said in his Sunday afternoon lecture. He described four different ways to attack and capture a third-line stone. 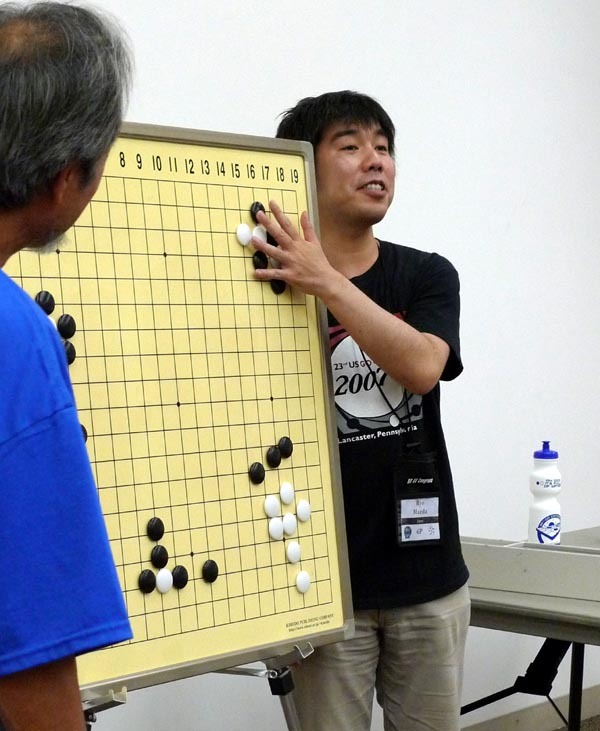 The key is “how to make your stone more effective than your opponent’s,” Maeda said. It’s important to protect weak stones: “If you have a weak stone, you protect it — that’s it.” In addition, “if you want to capture your opponent’s stone, make your group stronger, then good things happen.” Use the normal move in most cases, Maeda advised, “and leave the best move to professionals.” Looking at contact fights, Maeda pointed out that nearby friendly stones can be liabilities in such situations, as weak and strong positions can get reversed. Stones or groups with two liberties are considered weak, and with one liberty, “it’s too late.” However, “when you atari but can’t capture, it’s usually a bad move.” Yoshi Sawada 6D provided his usual animated translation of the Maeda method, which will be detailed in three more lectures this week. Maeda’s popular lectures have been a feature of U.S. Go Congress for the last ten years.